Joining the line with rival chat apps WhatsApp, Viber, Facebook Messenger, and Signal, the Telegram instant messaging service has finally rolled out a much-awaited feature for the new beta versions of its Android app: Voice Calling. And what's interesting? Your calls will be secured by Emojis, and quality will be better using Artificial Intelligence. No doubt the company brought the audio calling feature quite late, but it's likely because of its focus on security — the voice calls on Telegram are by default based on the same end-to-end encryption methods as its Secret Chat mode to help users make secure calls. Unlike Signal or WhatsApp, Telegram does not support end-to-end encryption by default; instead, it offers a 'Secret Chat' mode, which users have to enable manually, to completely secure their chats from prying eyes. However, the voice calling feature in Telegram supports end-to-end encryption by default, enabling users to secure their chats in a way that no one, not even Telegram or law enforcement, can intercept your calls. Telegram features an interesting key exchange mechanism to authenticate users and make sure their calls are even more secure: Users are required just to compare four emoji. While making a call, you will see four emoji on your mobile screen and so the recipient. If the emoji on your screen match the recipient's, your connection is secure! "The key verification UI we came up with in 2013 to protect against man-in-the-middle attacks served well for Telegram (and for other apps that adopted it), but for Calls, we needed something easier," Telegram said in a blog post published Thursday. "That's why we've improved the key exchange mechanism. To make sure your call is 100% secure, you and your recipient just need to compare four emoji over the phone. No lengthy codes or complicated pictures!" What's more? 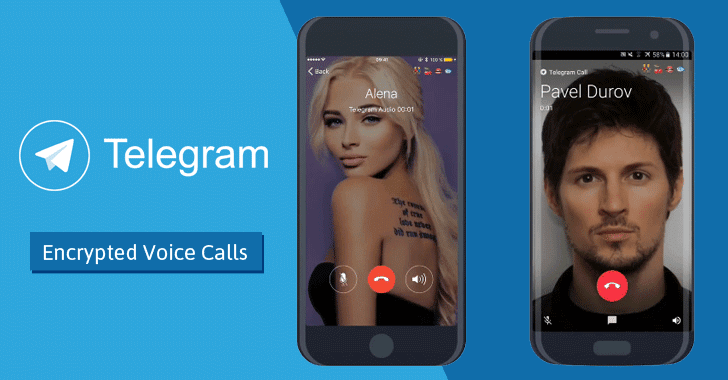 Telegram ensures its users that the audio quality of the voice calls has kept as high as possible by using a peer-to-peer connection, the best audio codecs, and Artificial Intelligence. Developers say that audio quality of the call is "superior to any of our competitors" by including an AI neural network. So, each time you make a Voice Call, your Telegram app's AI neural network will optimize dozens of parameters based on technical information of your device and network such as network speed, ping times, packet loss percentage, to adjust the quality of your call and improve future calls on the given device and network. "These parameters can also be adjusted during a conversation if there's a change in your connection," the company states. "Telegram will adapt and provide excellent sound quality on stable WiFi — or use less data when you walk into a refrigerator with bad reception." Note: AI doesn't have access to the contents of the conversation, so your calls are completely secure. Unlike WhatsApp and Facebook, Telegram lets you control "who can and who can't call you with granular precision." If you don't want anyone bothering you, you can simply switch voice calls off altogether, blocking anyone and even everyone from calling you. Telegram also offers users direct control over the quality of videos they shared over the platform. You can adjust the compression and see the quality of the video before sending it to your friends. You can also set the video compression rate as the default setting for all your future video uploads. Telegram version 3.18 which includes new features, such as Voice Calling, is free to download for iPhone on the App Store and Android phone on the Google Play Store.